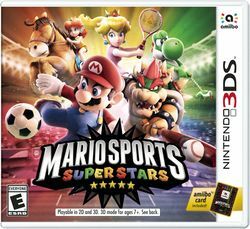 Mario Sports Superstars is a Mario sports title for the Nintendo 3DS. It features a variety of sports in which Mario and many other characters from the Mario universe can compete, including soccer, baseball, tennis, golf, and horse racing. 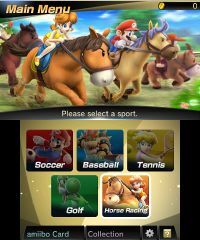 Horse racing is the only new sport in the Mario sports spin-offs, while the rest of the sports have seen stand-alone games prior to Mario Sports Superstars. The game supports local multiplayer and is able to support two, four, or six players depending on the sport played, though this title is one of the few multiplayer-oriented Mario titles to not feature Download Play. Players can additionally play against opponents online, either worldwide against random opponents or with their friends. The game is primarily developed by Bandai Namco Studios, with Camelot Software Planning, the main developer for the Mario Tennis and Mario Golf series, contributing the golf and tennis portions of the game. The game requires 6,589 blocks of free space if players wish to download the title off the Nintendo eShop. The game is compatible with amiibo, and a new Mario Sports Superstars line of blind-packaged amiibo cards were released for the game. Those who purchased one of the "initial run" copies of Mario Sports Superstars at retail received a free, randomly selected amiibo card from that line. The main menu for Mario Sports Superstars. 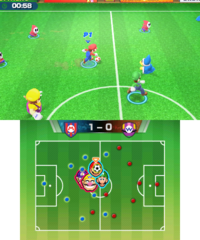 In a similar manner to another sports compilation, Mario Sports Mix, each sport plays out as its own separate mode. The tennis and golf sports play similarly to Mario Tennis: Ultra Smash and Mario Golf: World Tour. Each mode has its own tournament mode, a three-tier system that has eight participating players in total, catered to single players. Three cups are available, with the first cup being the Mushroom Cup, the second being the Flower Cup and the third being the Star Cup. Completing the Star Cup unlocks the Champion's Cup, and completing said cup unlocks Star versions of playable characters, who have increased stats. The player needs to unlock Star characters for each sport individually. 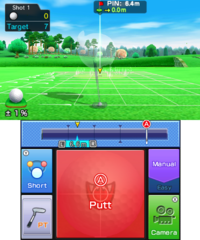 Each sport has its own training mode as well, where players can practice shots or techniques freely. 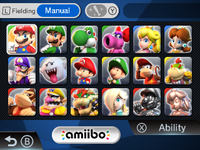 Alongside the main sports modes, additional tabs on the main menu screen include "amiibo Card", "Collection", a settings icon, and a manual icon. Coins can be earned when a task is completed, such as winning a match in exhibition or winning tournaments or finding crates with coins inside them in horse racing. They are used to buy randomly packaged cards in the shop. Mario dribbling a ball in soccer. 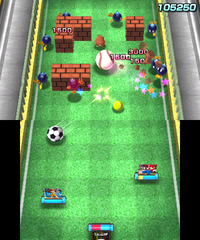 A sport previously playable in the Mario Strikers series. Unlike that series and as in the actual sport, players participate in 11-vs-11 matches. Teams are composed of a designated team captain, who represents the team with their shield emblem, an assistant captain, who is another team captain character as an ally, a goalie (either Boom Boom or Pom Pom), and the rest are supporting generic characters such as Koopa Troopas or Shy Guys, which are filled out with only one type of character. Prior to beginning a match, players can adjust placement of their entire team in various formations. On the top screen, team members are identified by specific HUD circular markers underneath them, and on the Touch Screen, by their team's color. Both captains are represented by icons of their faces and are displayed in their current position while the generic characters are represented by dots. Once players select their team and formation, players have the option to save the team as "My Team", which allows for ease of access if players have a select favorite team they wish to use in future games. During the middle of the match, players can change their team formation as they wish, including when a half-time is called. 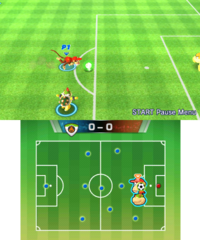 As in the Mario Strikers games, the object is to kick the ball into the opponent's goal, overcoming the opposing team members and their goalie, who attempts to block balls, within the designated pseudo 90-minute time limit (the speed of the time limit goes up depending on the settings, but generally speaking, having the highest time setting, 15-minute matches, causes the time limit to slow down). Halfway through the match, at the 45-minute mark, players halt the game and are taken to a screen that records the current progress of both teams. Afterward, the losing team initiates the kick, and the game continues, with the team's goals reversed until the 90-minute mark is reached. Whichever team has the most goals by the end of the match wins the game. Whenever a goal is scored, a replay of the shot is shown. Players can skip the replay if they wish or change the angle from which it is shown. The opposing team captains then get possession of the ball and start off in the middle of the field, beginning the play again. Unlike in those games, however, players have more control options and strategies available to them to accommodate the actual sport's additional rules. For example, players on the defense can attempt to steal the ball in possession from other players via slide-kicks, pressure defending with their team via the or by themselves with (per the default Type A control scheme), or by simply running into the ball. Players who possess the ball may attempt to dodge confrontations by sliding around holding by default. However, if the character in possession of the ball is struck with a slide-kick without the ball being touched, a foul is called and the player who is hit by the slide-kicking player earns a free kick, which depends on the orientation where the foul was initiated. There are now throw-ins if the ball rolls out of bounds, and if this happens in the area adjacent to the goalie, a corner kick is initiated instead. If the opponent team knocks the ball into their opponent's goal side, a goal kick is initiated in which the goalie kicks the ball back onto the field. 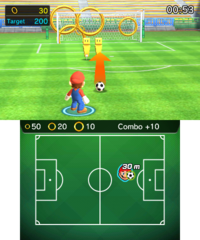 When kicking into the goal, players may press and hold the button to charge up their shots; a meter is represented below the character to indicate how powerful the shot will be. Certain types of passes also have their own power meter that indicates the power of the pass. Players can additionally perform an extra technique of kicks if is held and a corresponding button is pressed, such as lobbing a pass with + . Boo performing a Special Shot. Powerful Special Shots can be performed by the captain and assistant captain when the ball starts to sparkle. Each Special Shot has a unique visual effect that varies with the character. 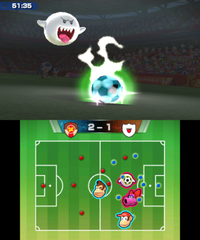 Team captains may also pass the ball using their Special Combo Shot move to another captain when the ball is glowing as well. All actions are tied to a character's stamina, which is represented by a blue arrow above the controlled character. The more a character plays and dashes across the field, the more stamina is lost. Characters who have a lowered stamina bar have weaker passes, shots, and speed. Players replenish stamina when they do not partake in any action. In multiplayer mode, up to four players can play this sport in local multiplayer, while only two players can play in online play. However, if two players are playing, either in local or online multiplayer, they cannot choose to be on the same team up against a computer player controlling the other team. COM skill level: Players can select from Beginner, Intermediate, Advanced, and Pro skill levels. The Pro skill level is unlocked when players clear Champion's Cup. Special Shots: Players can enable or disable Special Shots. Total Time: Players can adjust the total time of the match from approximately 5, 7, 10, or 15 minutes, which affects the potential frequency of Special Shots and the speed of the in-game clock. Extra Time: Players can play in an extra period of the game ends in a tie or disable the feature. Penalty Kicks: This can decide the game by penalty kicks of the game is tied, if toggled on. 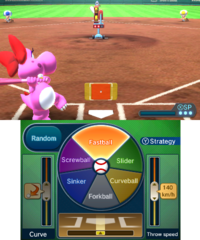 Pitching against Yoshi's team in baseball. 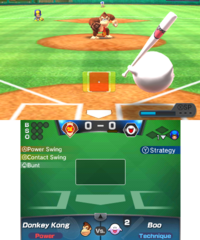 Baseball involves two teams of nine characters against each other, similar to the Mario Baseball series, as well as having various elements and gameplay mechanics taken from that series. Players need to select a team captain, as well as selecting an assistant captain, similar to how soccer plays out. The seven slots can then be individually filled with the player's choice, from a pool of generic characters such as Koopas, Toads, etc, unlike the soccer, where the player's team is homogeneous with a single species. 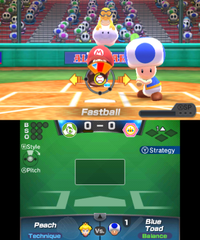 Team members hold a bat that has their team captain's logo and design on them, unlike the Mario Baseball series, where they all had their own individual bats. Just like in soccer, players can save their favorite team and formation as "My Team" once their team is fully constructed for ease of access if players wish to use said team again. Players play in two positions of baseball; the team on offense takes turns within their members to bat the ball while the team on the defense pitches and covers the outfield. Players on the pitching mound can pitch using various methods, such as fastballs, forkballs, and screwballs to throw batting players off. 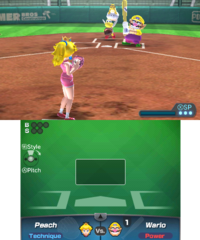 Pitching has slightly different controls than the ones in the Mario Baseball series. Meters and HUD are used to time pitches and their type rather than pure button-inputs; to pitch a ball, players can sort through different pitch methods and time the spinning meter with the designated colored sweet spots within ten seconds. Players who bat earn strikes if the pitched ball goes over the home plate and they either do not hit the ball or miss the ball. A ball is called when the pitched ball does not cross over the plate; however, if the batting attempts to swing at such balls, a strike is called. Three strikes mean the player is out. If the batting player hits the ball and it lands on the foul zone, the player must rebat the ball at a cost of the strike, though it does not earn an out if they hit in a foul zone over three strikes. If there are four ball penalties, the batting player gets to walk the base. If the pitched ball hits the batting player, the batting player also gets a free walk to the base. Pitchers have stamina; more hits from the opposing team depletes stamina quicker. Over time, the pitching meter moves faster, meaning it is harder to hit the sweet spot markers correctly. Characters who tire out have very fast spinning meters, and are encouraged to switch to another character so players can be more accurate timing their pitches. Boo batting against Donkey Kong. If the batting player hits the ball successfully without causing the ball to go in the foul zone (the areas to the left and right of the diamond, marked by lines), they can run towards the three bases in a specific order, until the fielders throw the ball into the fielders manning the bases. If the fielders catch a fly ball, the runner is out, and if there are multiple runners, they need to progress back towards their previous base. Fly balls can additionally be caught even in foul zones, and if they are caught before they bounce, the batter is out. Any runner who is tagged by a fielder before they reach a base is also considered out. Players earn points for their team if they circumnavigate the baseball diamond by touching all bases and reaching the home plate while avoiding receiving an out. If a batter receives a home-run, which means to send the ball out of bounds within the fair zone, they, alongside any additional base runners earn free points. 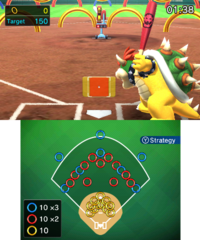 Captains can use Star Skill-like abilities, such as Bowser using a fiery swing to knock the ball further away to possibly score home-runs. If runners are on bases, they have the option to steal a base while a pitcher is pitching. However, if the outfielder tags them before they can steal a base, they are considered out. Batting players have the option to bunt the ball as well. Bunting is a very slow and weak technique that can guarantee a hit, but, if done incorrectly, they either receive a foul if the ball rolls out of bounds or outfielders can pick up the ball and tag the bunter out. Baseball games are split into innings, which players can set up to 9 innings. Once three outs are received for the batting team, both teams swap positions, where the defensive team now bats while the batting team goes to the outfield. Whichever team has the most points by the end of the last inning wins the game. Up to two players can play this sport, both in local and online multiplayer, where they both are required to be in their own teams. Fielding: By default, fielding is set to auto, meaning the AI controls the outfielders when the ball is struck. Semi-auto fielding means that the player can control their outfielders somewhat, such as directing them where to throw the ball, while manual fielding indicates that players assume total control of the outfielders with some exceptions. Special Moves: Players can enable or disable Special Moves. Innings: Players can adjust the number of innings for a period from 3, 5, 7, or 9 innings. Batting Turn: This determines the order of which players bats or fields first. When "First" is chosen, the player is the first one that bats; when "Second" is chosen, the CPU bats first. Mercy Rule: When on, the game ends early as soon as a player receives a 10-run lead. Extra Innings: If on, three extra innings will be played if there is a tie. Luigi playing tennis against Waluigi. 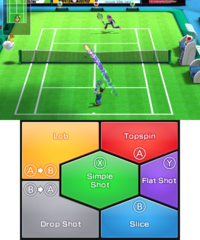 The bottom screen has HUD detailing the types of shots and button inputs required, with HUD being similar to Mario Tennis Open. Tennis plays very similarly to the Mario Tennis series, with elements and mechanics of the game taken from the two most recent installments before Mario Sports Superstars's release; Mario Tennis Open and Mario Tennis: Ultra Smash. Players can participate in either singles, one-on-one tennis or doubles, 2-vs-2 tennis. Chance Shots, Jump Shots, and the Ultra Smash make a return. 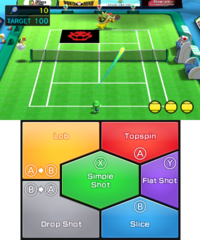 This mode retains the touch screen functionality from Mario Tennis Open, where players can view controls for specific shots, as well as the bottom screen indicating what button combination to use to perform specific Chance Shots or to counter specific Chance Shots. Players can opt to play in Simple mode, where Chance Shots are turned off. Tennis gameplay is as follows: players first serve a ball before it goes into play, where the speed of the serve depends on the height where it is hit from; players serve the ball the fastest when the ball is hit at its apex. Characters have different timing for serving their fastest shots, and the character's ability to serve is dependent on their power and spin; characters who have greater power can serve balls at quicker speeds, while characters who have a better ability to curve make it more difficult to return the ball. While receiving the ball, players need to wait until the ball bounces once; if they hit the serve before the ball bounces, a foul is called and the serving player receives a point. If the ball hits the square directly across the player, a fault is called and the player needs to serve the ball again. If players get another fault, they receive a double fault and the receiving player earns a point. If the ball hits the net while it is served, the server needs to retry the serve, but without any penalty. Receiving players can perform a Taunt to increase the power of their next shot. Princess Peach serving against Birdo. After the serve, players need to rebound the ball until their opponent cannot return the ball or if they hit the ball out. 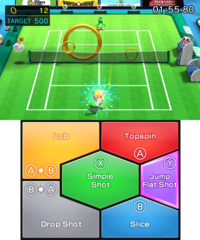 Players can choose from four basic types of shots: simple, topspin, slice, and flat, depending on the button they hit to rebound the ball. Simple shots are activated with players press . Intended for beginning players, simple shots are weak shots, but can be any type of the three latter shots. They can also activate any Chance Shot, but these Chance Shots are weaker than when manually inputted. Topsins are indicated by a red outline and are activated when the player hits ; they are high shots that bounce high, and they are more powerful than slices, but weaker than flat shots. Slices are indicated by a blue outline are activated when the player hits ; they are low and weak shots that curve the ball moreso than other shots. Flats leave a purple outline and are the fastest shots but are the most difficult to control. They are activated when the player hits . Players can input more advanced shots by hitting two buttons in conjunction rather than one; these shots cannot be used in serves. Lobs can be performed if the player hits then . Lobs are very high shots, indicated by their yellow outline, that can fly over a net player, but can open up opportunities for a Smash Chance Shot for the opposing player. If players press then , they can perform a Drop Shot. Indicated by a white outline, Drop Shots are very slow and low shots that end up near the net; this tactic is used to force players up to the net. If a ball is out of the player's reach, the player can attempt a lunge to hit the ball. However, this usually results in an Ultra Smash opportunity for the opponent. A doubles match being played with Bowser Jr. and Diddy Kong against Yoshi and Birdo. Chance Shots, first introduced in Mario Tennis Open, are more powerful versions of the aforementioned types of shots and are activated when the opposing player makes a bad return. When this occurs, an icon representing the Chance Shot appears on the player's side of the court, where the player needs to move over it and perform the type of shot represented by the icon and color. The color of the Chance Shot corresponds to the type of shot that will be activated: for example, red Chance Shots represent a topspin Chance Shot, so pressing or over this Chance Shot causes a fiery topspin that knocks players back. Players can counter Chance Shots with an appropriate counter; for example, if the opponent uses a topspin Chance Shot, players need to correctly deflect it with a slice; otherwise, the player may do a bad return and set up opposing players for an Ultra Smash. 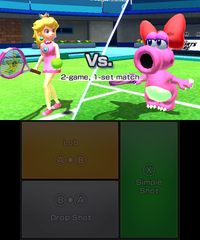 Players can press the shot button twice to perform a Jump Shot, first introduced in Mario Tennis: Ultra Smash. These cause the character to leap to return higher shots. They are stronger than grounded shots, but they have a loss of control. If the opposing player messes up, either by lunging at the ball or using the wrong button input of countering a Chance Shot, a special type of shot gets triggered, causing the ball to fly high and the Chance Shot area to exhibit special effect. If players use the input for the Jump Shot at the moment this Chance Shot appears, they can leap to execute an Ultra Smash, the most powerful shot in the game. Points are earned when the opposing player fails to return the ball within two bounces or if the opposing player get hits by the ball (called a Body Shot). If the player who hits the ball hits it outside of the defined boundaries, an out is called and the opposing player earns a point. A replay is then played to show the last few moves before the point is scored. Players can view the replay, skip the replay, or change camera angles of the replay for other perspectives. A special animation plays whenever the Ultra Smash is executed to earn a point. Points are earned in increments of 15, 30, and 40. When a point is earned when a player or team is at 40, they win a game or a break point. If both players or teams have 40 points, then a Deuce is called and whichever player manages to have an advantage of two points wins the game/set point. If both players or teams win the same amount of games into a set point, a Tiebreaker is called. During a Tiebreaker, whichever player scores 7 points wins the set/match point. A game set is won when players earn the required amount of game points. Players eventually win the match when they earn the amount of set points required. Up to four players can play tennis in local multiplayer and in online multiplayer with friends, where players can opt to change orientations with their team prior to starting the match if they choose to select to play in doubles, and unlike soccer and baseball, human players can choose to face off against a team of CPU players. In playing against randoms online, singles are the only option, thus making only up to two players possible in playing against random online players. Hand: Players can choose to play with either a right-handed player or a left-handed player. COM skill level: Players can select from Beginner, Intermediate, Advanced, Pro, and Ace skill levels. The Ace skill level is unlocked when players clear Champion's Cup. Sets: Players can adjust the number of sets with 1, 3, or 5 sets. Games: Players can adjust the number of games with 2, 4, or 6 games. Play Style: When players play with Standard play style enabled, they play with Chance and Jump Shots. When selected on the Simple play style, Jump and Chance Shots are disabled. 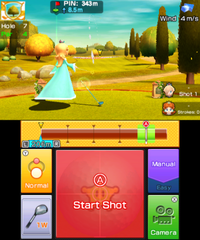 Rosalina golfing. The bottom screen displays ball contact, types of spins, and the power meter on the top. 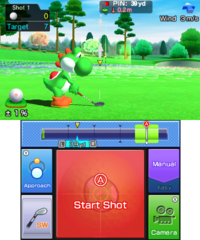 Very similar to the Mario Golf series, players can golf on one of the many courses. 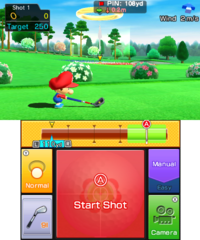 Much of the graphics, HUD, elements, and mechanics are taken from the latest iteration of the Mario Golf series, Mario Golf: World Tour, including the bottom screen that includes information such as ball contact, ball spin, and the power meter. Players can either play two modes: Stroke Play, which players can golf for 9 holes or Ring Challenge in training mode, where players need to send the ball through large rings dotted across the course. This mode lacks Match Play from previous installments, meaning that the only way players can play against the computer player is if they are randomly selected on tournament modes. In golf, players need to sink the ball into a hole within a set number of shots, which is dependent on the course. Players are recommended to score at least a Par, which means the player has taken the number of strokes required for the ball to go into the hole. If players achieve less strokes than required, they earn better scores, such as a Birdie. However, if players take more strokes than required to sink the ball into the hole, it worsens their overall score, and thus are called Bogeys. Golf uses a power meter to determine power and control of the ball. Players need to time the rising of the bar, which determines the power of the shot, as well as the descending, which determines the accuracy of the shot. If players hit outside the marked boundaries of the power meter the time it descends for accuracy purposes, players whiff the shot, often costing a stroke. Players can get perfect accuracy if the bar hits the sweet spot of the meter; if the bar is stopped outside the sweet spot, the ball veers in the direction the bar is stopped at. In other words, if the bar is stopped to the area left of the sweet spot, the ball curves towards that direction, causing some inaccuracy within the shot. 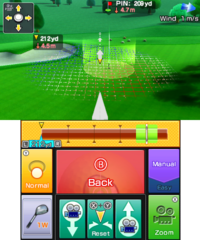 Additionally, players can adjust the trajectory of the ball (which is indicated by arrows rising and falling on the main screen) by changing the area of ball contact, indicated by the bottom screen. Hitting the ball in the upper regions decreases height, while hitting the ball left or right causes the ball to curve left or right depending on the direction hit, often used to bypass obstacles such as trees. Newer players can opt for the "easy" option, where players need to manually input only the rising of the bar while the game automatically times the lowering of the bar for accuracy. However, this method is not perfect and may result in mishits, especially if the sweet spot is very low. In addition, players need to take in account of the environment, which causes the ball to behave in different ways. Wind can change the ball's trajectory, and the speed of the wind as well as the direction it blows in depends on how affected the ball gets. Balls that have higher trajectories are more affected by the wind. The ball's lie is also affected by the ground it is on. If the ball is on the Fairway, there are no added penalties to the ball. However, if the ball lies on the Rough or Bunkers, the power and accuracy of the ball gets affected depending on how severe the terrain is. Topology of the course can also affect the ball's trajectory, where, often, more powerful, higher shots are needed to send the ball to higher elevations. Rain reduces power and spin of the shots, and players need to opt for significantly more power when they are putting the ball. Baby Luigi putting on the Green. Different clubs have different purposes, and players can swap between clubs any time for varying needs. Woods, represented by "W", send the ball flying further at the cost of accuracy while irons, represented by "I", forgo ball drive in favor of accuracy. Sand wedges, represented by "SW" are used to get balls out of bunkers. Hybrids, represented by "H", are a mix between woods and irons and are used for compromising purposes between irons and woods. Pitching wedges, represented by "PW", are used to send balls flying higher and shorter than irons. If the ball is sent too far or not far enough, players can adjust drive distance by pressing and for guidelines on where to lower or increase power of the shot. As well as having different clubs, players can opt for Power shots or approach shots. Power shots have a limited use per round, but can send the ball flying even further and are used typically to aim for lower strokes on Par 4 or Par 5 holes. If players align the bar in the power meter perfectly whenever a power shot is used, they save a power shot. Approach shots are made when players are near the Green, which are weak shots used to knock balls close to the hole. When players are on the Green, players can putt the ball into the hole, using one of three putters depending on the distance to the hole. In this case, players need to time only the rising of the power meter to make putts, where higher bars are stronger putts. Players who putt too weak cannot make the ball into the hole, while too powerful putts send the ball past the hole. Grids on the putting screen indicate topology of the course. Slopes are represented by white balls rolling on the grid, indicating the direction it will roll in. Slopes that are steeper are indicated by quicker rolling balls and therefore, players need to adjust their position more the steeper the slope is. Downhill slopes are indicated by red on the grid while uphill slopes are colored blue. Players need to putt harder for uphill slopes and weaker for downhill. Different types of spins return from Mario Golf: Toadstool Tour, where players can activate them as soon after they stopped the power meter a second time if they are using manual rather than auto. Topspins send the ball forward while backspins either brake the ball or send the ball backward depending on the height the ball falls from and the speed of the shot. Players can perform a topspin if is hit twice, while performing a backspin if is hit twice. Players can use more powerful spins for a longer effect if alternate buttons are pressed; players can perform a super topspin if is hit first and then , while a super backspin is performed if is pressed first and then . Up to four players can play golf, both in local and online multiplayer. 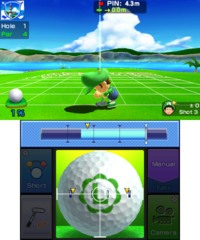 However, requiring more players to play requires more cartridges and game systems, which emulates Mario Golf: World Tour's requirement of playing with more players rather than a single player controlling all characters and thus can pass the controller to other players as Mario Golf: Toadstool Tour handles in its multiplayer. Swing: Players can choose to play with either a right-handed player or a left-handed player. This reverses a Fade or Draw trajectory. Holes: Players can play with 9, 6, or 3 holes. Shuffle: When turned on, this plays on holes in a random order. When turned off, this plays holes in a set order. Tee Position: If the setting is on "Regular", the game starts from tees closer to the hole. Selecting "Back" starts the game with tees farther from the hole, while "Tournament" starts with the farthest, most difficult tee. Flight Path: This toggles flight path on or off. Wind: Players can adjust the general wind speed with weak, strong, or random. Higher wind speeds buffet balls around more. Characters race each other saddleback on horses as they leap over hazards and dodge obstacles, a sport entirely new to the Mario series. Before players start up their game, they can choose and customize their horse. The first option is selecting a male or female horse, and players can then choose a type of horse from four different types and builds: balance, technique, speed, and power. Players can then select horses from a variety of colors, all which have different stats from one another; after that has been selected, players can choose to name their horse. When players have a horse in their stable, they can choose to release it any time; however this removes all bond progress made with the horse. Up to 16 different horses may be kept in a stable. Players can groom, pet, and feed horses, which betters their mood. Horses with higher mood rating, indicated by ♪, start out with more parts of the Star Dash meter filled prior to starting the race. When feeding and petting the horse, each horse has a specific food they like, dislike, and each horse has an area they love and hate being petted on; the preferences for what a horse likes is randomly selected and players find out only when the horse reacts to the food and petting in a certain way. The available food choices are grass, which all horses can enjoy and players have an infinite number of regular grass, carrots, apples, corn, lettuce, and barley, and players can pet their horse either on the head, the neck, the belly, or the rear. Feeding the correct item and petting the horse in the right spots increases their mood substantially. Reward food such as candy, sugar, and honey may be occasionally found; horses love all three types of these reward items and feeding them reward foods substantially increases their mood. Players can additionally find better versions of grass, carrots, apples, corn, lettuce, and barley, and feeding not only the food the horse likes improves their mood but a higher quality feed substantially betters their mood. Walking the horse in a field in stable mode. During stable mode when players are in control of their horse once they are out on the field, players control and view their horse in a first person perspective. 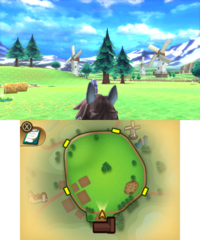 In the field, players can find areas of interest by walking around on their horse on the field. Players can approach various areas of interest indicated by sparkling grass or flowers. In sparkling grass, players can either see their horse eat the grass, which has a chance of improving their mood once the walk is done, or find a wooden ? crate, which has either a regular accessory, feed, or coins. If players find a Little Bird in the grass, they receive a Mario Token, where 20 of them can be found; when players find all 20 Mario Tokens, they unlock the Mario Token Crown head accessory. If players find a rabbit on the grass, they receive a rarer item, such as a rarer accessory or a reward food. If players have a greater bond rating for their horse, the rarer items and higher quality feed will be easier to find during walking around the field and outings. If players interact with sparkling flowers or a sparkling pool of water, they both increase the chance of improving the horse's mood once the walk is done. 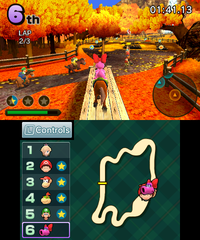 Players can take their horses to an outing on the first track of each of the four themed tracks on this game. Players can receive items during the outing by running past the ? crate icons, where they can receive feed, coins, or rare items; additionally, these outings can improve a horse's mood. Players can decorate their horse with any accessory they have unlocked, including their saddle, hats, and the bridle. Accessories do not change a horse's stats, as they serve for aesthetic purposes only. Accessories have a certain theme and color for each set: for example, players have five different types of Witch's Hats, each in their own color. Accessories can come in series: players can obtain, for example, Gorgeous Crowns, Gorgeous Bridles, and Gorgeous Saddles to decorate their horse with a specific theme. When players obtain more accessories, the rate of acquiring accessories becomes exponentially more difficult and rarer to obtain. Players have a chance of obtaining rare Mario-themed hat accessories when they take their horse out for an outing. In facing off against more difficult CPUs, CPUs decorate their horse with accessories and are more elaborately decorated the harder the difficulty is; the type of decoration is also dependent on the character used. In the hardest difficulty, Pro, CPUs decorate their horses with the rare, complete set of accessories. After everything has been set up, players can choose to race their horse among other opponents. As well as having speed, control, and acceleration stats, horses have stamina and recovery of stamina, where players can replenish their stamina through collecting carrots or staying close to other players. Each character has different ratings of stamina and recovery; characters who have higher stamina and higher recovery means that they can speed up the horse more via , tire out more slowly, and their stamina replenishes more quickly. Collecting stars throughout the track fills the bar for the Star Dash technique, where, if fully filled out with five stars, players can use it to get a speed boost. Up to three Star Dash meters can be filled out. Double jumps can be performed to reach higher items that cannot be reached with single jumps. Horses travel faster when they are in a pack, in a phenomenon known as the Herd Effect, so stray players such as those far in the lead travel slower than when together; additionally, the Herd Effect causes stamina to replenish more quickly. Up to six players can participate in this sport, both in local and online multiplayer, making this sport being able to support the most players out of all sports. 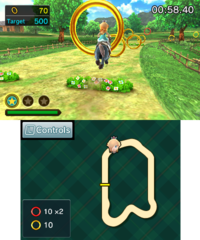 Players can use their personal horses kept in their stable saved in their data of the game. Star Dash: This toggles Star Dash on or off. Number of Laps: Players can play with 1, 2, or 3 laps. Number of Racers: Players can play with 2, 3, 4, 5, or 6 racers. COM Level: This determines the level of CPU opponent racers, from Beginner, Intermediate, Advanced, and Pro. The Pro difficulty level is unlocked when players clear the Champion's Cup in tournament mode. Each sport has its own training modes. In order to unlock Pink Gold Peach, players need to complete the sport's respective ring challenge mode on Hard difficulty. When players complete it, as well as Pink Gold Peach being unlocked, players unlock a Pro version of the mode, where players aim for the highest score. The type of training is dependent on the sport played, which is outlined by the following. Ring Challenge Players need to shoot the ball past dummies made out of Rotating Blocks and into the rings to score a set amount points within the posted time limit. Higher difficulties require more rings to be shot through; Hard difficulty has a goalie that attempts to deflect shots. Free Training Players can choose captains, their team, and play in a field where the only opponent is the goalie. Players have an infinite amount of special shots they can use. Ring Challenge Players need to hit the ball through colored rings on the outfield. Yellow rings are worth 10 points, red rings are worth 20 points, and blue rings are worth 30 points. In higher difficulties, players need to shoot through more rings within an increased, compensated time limit. Batting Practice Players can use a pitching machine to practice batting. Here, they can adjust pitching speed, the type of pitch, and the different types of orientations of the ball when pitched. Ring Challenge Playing very similarly to the Ring Shot minigame of previous Mario Tennis entries, especially Mario Tennis Open, players hit balls through rings on the Grass Court; to complete this mode, players need to earn a certain amount of points within the time limit. Smaller rings are worth more points, and red rings are worth twice the amount as yellow rings. In harder difficulties, players need to lob or drop shot the ball to pass through some trickier rings. Rally Challenge Playing similarly to Galaxy Rally from Mario Tennis Open, players need to hit the ball over the court without hitting the Bowser panels. Players have three lives, and they lose a life whenever the ball hits the Bowser panel, if they fail to rally the ball back, or if they are body shot by the ball. Players lose the game if they lose all lives. In higher difficulties, more Bowser panels cover the court, as well as needing to rally the ball back more times. Ring Challenge Players need to hit through a ring and land on the designated target areas near the hole. Landing closer to the hole causes the player to earn more points. However, if players miss the ring completely, they do not earn any points; additionally, players do not earn points if the ball does not land on the target areas. In harder difficulties, players contend with trickier lies, as well as putting the ball into the target areas while accounting for the topology of the course. Shot Practice Players need to hit the ball onto the designated glowing circle. Harder difficulties have trickier lies, stronger wind, and more sloped areas. Approach Practice Very similar to Shot Practice, except players are closer to holes and use approach shots to land the ball on the designated glowing circle. Putting Practice Very similar to Shot Practice, except players put the ball close to the hole onto the glowing circle. Higher difficulties of this training has more inclined slopes and farther away holes. Ring Challenge Players need to steer their horses through rings on the tracks within either the time limit or one lap around the track. In this mode, players have infinite stamina and one use of the Star Dash technique. Collecting rings while the players are Star Dashing doubles the output. Red rings are rarer and are worth twice the amount of yellow rings. In higher difficulties, players take on more difficult tracks as well as an increased ring amount they need to collect. Free Training Players can practice on any track they can choose without opponent racers. Mario Sports Superstars keeps track of stats depending on the sport. The following is the list of all stats and the following descriptions. With People Nearby: The game keeps track of matches, wins, losses, draws, and the win percent when playing with local multiplayer options. With Friends Online: Similar to the previous stat, except it deals with the player's friends online. With Players Worldwide: Similar to the previous stats, except it records playings with randoms worldwide. The game additionally keeps track of the rating score, which is used for matchmaking purposes online. The Best Rating score keeps track of the player's peak rating. Tournament: This menu keeps track of the total number of trophies won from completing tournaments. General Stats: In soccer, total play time, total matches, total victories, total goals, total special shots, and total special combos are recorded. In baseball, total innings played, total runs, total runs allowed, scoreless innings in a row, total home runs, total base hits, total special moves used, and total dead ball fouls are recorded. In tennis, total play time, matches played, matches won, singles win percent, doubles win percent, points won percent, service aces, and smash aces are recorded. In golf, total play time, total rounds, overall victories, greens-in-regulation rate, average putts per hole, drives-in-fairway rate, Birdie-or-better rate, and Eagle-or-better rate are recorded. In horse racing, total course laps, total races, 1st place finishes, Star Dashes used, and time in herd are recorded. A set of amiibo cards. Mario Sports Superstars introduces its own line of amiibo cards, where each character receives 5 cards based on the sports of the game. There are 90 cards in total. The amiibo cards are blindly packaged separately in sets of five for US$4.99 (AUS$7.99$) each, similar to the Animal Crossing line of amiibo cards. While Star characters can normally be unlocked when Champion's Cup in tournament mode is won, Star characters can be unlocked immediately through tapping the corresponding character on the card. amiibo cards can be used for players to power up to unlock superstar versions of the character on the card. Three stats specific for the sport are displayed on the card. The red bars indicate the stats characters start with, while the blue bars display the stats of a starred character and the yellow display the stats of a superstar character. Any stats with blue arrows facing to the left means that the stats are decreased when a certain stat is increased; this stat hindrance mirrors starred characters in the Mario Golf series, where their drive increases at the cost of impact. Unlike the Animal Crossing amiibo cards, the Mario Sports Superstars amiibo cards only work specifically for Mario Sports Superstars, thus do not work or recognized as a generic amiibo in other games. (e.g: Daisy in Horse Racing does not unlock Daisy Yoshi in Poochy & Yoshi's Woolly World or Birdo in Golf does not unlock a Birdo costume in Super Mario Maker). Additionally, amiibo cards can be used to unlock new gear for characters to use, which is displayed on the card. This mode is mostly related to the digital card collection, however also allows access to the Sound Test and staff credits. Players can access the shop, where they can buy packs of digital amiibo cards with coins earned in-game. These cards are randomized which allows for doubles. Players can buy a 3-card pack for 300 coins, a 10-card pack for 1000 coins, or a 3 card pack with no doubles with 100 double cards. One amiibo can also be used to purchase one 3 card packs with doubles per day, having up to three different amiibo taps per day. The collection album displays cards the player has owned, as well as organizing them with 18 categories: Super Rare, Rare Football, Rare Baseball, Rare Tennis, Rare Golf, Rare Horse Racing, Normal Football, Normal Baseball, Normal Tennis, Normal Golf, Normal Horse Racing, Sub Character, Pro Football Gear, Pro Baseball Gear, Pro Tennis Gear, Pro Golf Gear, Pro Horse Symbols, and Horse. There are a total of 324 digital cards to collect. The Road to Superstar minigame. This minigame can be played when players tap three amiibo cards. The minigame seems to be inspired from Breakout, where players use their selected amiibo cards to deflect various gear themed after the sports they are designed, with each gear projectile having a different property. Prior to beginning this mode, players can adjust placement of their three cards on a grid. Players need to destroy Brick Blocks and defeat enemies (or wait until the enemies walk offscreen) to proceed through the stage. When an enemy or opponent projectile touches a card, it gets knocked over and leaves an opening; players can quickly prop the card back up by tapping the button. Players can also change direction of the ball by holding the corresponding shoulder button, as well as increase the speed of the left and right movement of the cards by pressing the corresponding button. Players lose their projectile if the projectile passes through the cards; if players lose all available projectiles on the field, they lose the game and need to start over. If players lose the game three times in a row, they can activate Assist Mode, which places Brick Blocks on the bottom screen, though this mode halves the score obtained. Players can use a Special Attack technique if the projectiles hit the card enough times and the meter is filled out; cards closer to the top earn their Special Attack far more quickly. Once the meter is filled out, the Special Attack technique is used as soon as the projectile hits the card with the maxed out meter. The Special Attack increases the size of the projectile and destroys Empty Blocks and defeats Shy Guys in one hit. If a projectile is lost, a Goomba or Bone Goomba may occasionally appear carrying the gear: defeating this Goomba allows access to the projectile again. Players then defeat a mid-boss, a variety of the Hammer Bro species, before facing the boss of the stage, who is dependent on the progress of the player. Defeating this boss and completing this mode bestows a "Superstar" status to their character, greatly increasing all of the stats, moreso than a Star character. This is then scanned onto the amiibo card using the card's read/write capabilities. A high score is recorded as well, and if players have more projectiles after the completion of this mode, this also increases the high score of the player. 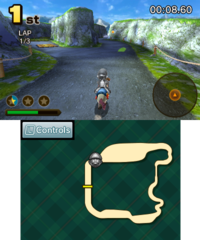 Players can adjust various settings to their liking when the icon is tapped on the main menu. The following is a list of all settings. BGM: Players can toggle the background music on or off. This does not turn off menu music and some jingles, however; turning off the music includes turning off the post-hole music from Mario Golf: World Tour where originally in that game, post-hole music would still play even if the music is turned off. Players can still listen to music in the sound test even if the music is turned off. Send Play Data: This sends play data to Nintendo via the use of Nintendo Network services. Blacklist: This deletes the list of players that players added in order to not have a match with them. Controls: This changes the control inputs of soccer to Type A, Type B, and Type C, all which have different control types. Speed: This changes the display unit of pitching speed from either km/h (kilometers per hour) or mph (miles per hour). Distance: This changes the distance display unit from either meters or yards. Putter: This changes the putter display unit from either meters or yards. Wind Speed: This changes the display unit of wind speed from either m/s (meters per second) or mph (miles per hour). Distance: This changes the distance of the tracks from either meters or yards. Each sport uses its own control scheme, and the controls often depend on the specific situation the players are in. There are 18 captains playable in this game. 16 of them are starter characters, while 2 of them are unlockable. In soccer and baseball, team captains are represented by their unique shield emblem whenever a game starts. In team-oriented games, such as soccer and baseball, players can additionally choose an assistant captain from the pool of team captains. Assistant captains are also able to pull off the same special shots that team captains can. Listed below is the method by which players can unlock the unlockable captains. Similarly to Mario Party: Star Rush, the characters can be unlocked by tapping in their corresponding amiibo cards, and like Mario Sports Mix, when a character is unlocked, they are only done so for the sport within which the criteria was filled. Each of the captains' types are represented by specific colors, names, and emblem shape. As each sport plays differently, these characters have different stats depending on the sport, but have similar general strengths throughout the sports. For example, Bowser is a Power-type character in soccer, and although baseball has different stats than soccer, power is still his strongest stat in that sport. Three of the five sports have characters that belong in the same four character types, with tennis and golf being the exceptions; their disparities are outlined in their respective sections. Balance characters have well-rounded stats. They can fit in any position but they do not excel at any stat in particular. Technique characters focus on accuracy and control. Speed characters have high agility and maneuver quickly. Power characters emphasize on strong shots that can either send balls flying further or shoot balls at higher top speeds. In horse racing, they emphasize on stamina instead. Power: The speed of the ball when the character kicks it. Characters with a higher power stat have higher ball velocities. Speed: The agility of the character in the field. Characters with a higher speed stat move around quicker. Finesse: The accuracy of shots of the ball. Characters with a higher technique stat are more accurate. Velocity: The pitching speed of the character. Characters with a higher velocity stat have faster ball pitching speeds. Power: The strength of the character. Characters with a higher power stat can send balls flying farther away more easily. Speed: The agility of the character. Characters with a higher speed stat move more quickly in the outfield as well as running bases. Notably, tennis uses more character types than in some of the other sports, as it uses character types already established in the Mario Tennis series. All-Around characters have well-rounded stats. They can fit in any position but they do not excel at any stat in particular. Speed characters have high agility and move around place to place quickly. Technical characters focus on accuracy and control. Defensive characters have high reach that allow them to reach balls with greater ease. Tricky characters specialize on making shots with a strong curve, making them more difficult to predict. Power characters emphasize on strong shots that can shoot balls at higher top speeds. Power: The stroke power of the character. Characters with higher power stats send the ball more quickly across the court. Speed: The agility of the character. Characters with higher speed stats can move around the court more quickly. Spin: The ability of the ball to curve. Characters with higher spin have balls that have stronger curves. In golf, characters are organized by their shot path tendency type, using three types of shot path tendencies. Assuming that all golfers are right-handed, characters with a fade hit their balls towards the left and curves to the right while characters who have a draw hit their balls to the right and curves to the left. Left-handed players have the opposite tendency of right-handed players. Characters with a straight shot hit their balls with no curve, and this is not affected by a change in their dominant hand. Characters additionally have different height trajectories. Characters who hit balls at higher elevations are more affected by wind than characters who hit their balls lower. However, higher trajectories allow characters to scale higher elevations more efficiently as well as hitting over trees more effectively. Power: The character's ability to send the ball. Characters with higher drive stats send balls at greater distances. Control: The accuracy of the character. Characters with higher control stats have overall better accuracy, and if the accuracy bar does not align properly, they receive less penalty. Sweet Spot: The size of the sweet spot markers. Characters with higher sweet spot stats are less likely to whiff the ball when aiming for accuracy, especially in roughs and bunkers.